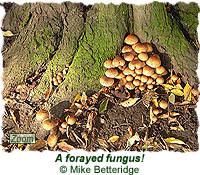 A number of fungi were forayed and Andy Woodall from the Mid Yorkshire Fungus Group talked about the role of fungi in helping the process of decay and recycling nutrients; the way they spread using a kind of root system (which we don't see) as well as via the mushrooms themselves that are the most visible bit and produce the spores. Andy also explained about which were edible and which were not. The pictures below show a few of the many species that were found on the day, and a full list can be seen after these pictures. Cep (Boletus edulis) - associated with Birch. Brown Birch Bolete (Leccinum scabrum) - associated with Birch. Black-Purple Crumble Cap (Russula atropurpurea) - associated with Beech. 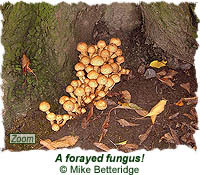 Honey Fungus (Armillaria ostoyae) - associated with Elm. Milking Mycena (Mycena galopus var. nigra). Candle-grease Mycena (Mycena inclinata) - associated with Oak. Alkaline Mycena (Mycena alcaline) - associated with Oak. Poison-Pie (Hebeluma crustuliniforme) - associated with Beech. Glistening Inkcap (Coprinus micaceus) - associated with Elm. The Bulsher (Amanita rubescens) - associated with Beech. Birch Bracket/Razor-Strop Fungus (Piptopurus betulinus). Vari-Coloured Brachet/Turkey Tails (Curiolus versicolor). Ear Fungus (Auricularia auricula-judae) - associated with Beech and Elder. Beech Jelly-Disc (Neobulgaria pura) - associated with Beech. 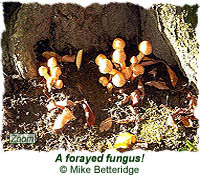 Candle-Snuff Fungus (Xylaria hypoxylon) - associated with various trees. 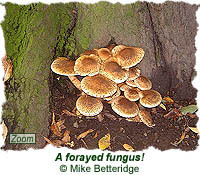 Artist's Fungus (Ganoderma adspersum) - associated with Elm. Beech Bracket (Pseudotrametes gibbusa) - associated with Beech. Tar Spot Fungus (Rhytisma acerina) - associated with Sycamore. Holly Leaf Spot (Trochila ilicina). If you have any photos or stories about past FGVW events you have attended, please contact us so we can add them to the site.